WildFire servers lets SSDs reach their peak potential. 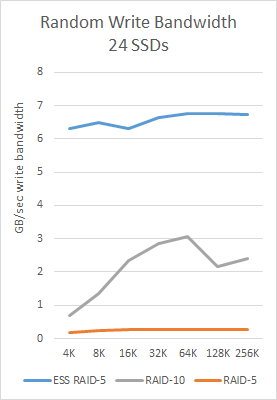 This graph of an actual benchmark shows write GB/sec for various random write blocks sizes. The top line is a 2U WildFire server with RAID-5 and ESS. Other lines are for stock RAID-10 and RAID-5 Linux arrays using the same hardware. Note that the stock RAID-10 and RAID-5 tests were with "fresh" media. Over time the performance of these tests would degrade even further while ESS maintains it's speed over time. WildFire is as much as 25X faster than bare SSDs. Note: Tests were performed on small SSDs, which typically have a linear write speed of under 400 mb/sec. Larger SATA SSDs typically linear write at 500mb/sec or higher, and as such will have double the linear and random write speed of the tested ESS-managed SSDs shown here. In such a situation, ordinary random access SSDs will not encounter much change. WildFire ESS technology delivers superior write performance. Our patented solution takes the random stream of writes arriving at a block device and converts them into linear writes with embedded control information. This has a couple of immediate performance benefits. Storage devices are most efficient when writing linearly. If you want maximum megabytes per second, write linearly. This is true of unmanaged Flash. This is true even with the best Flash SSDs. This is especially true with HDDs. In some cases, the raw bandwidth benefit of writing linearly can be over 100:1. RAID works best with linear writes. Random writes to RAID kills write performance. With RAID-1 and RAID-10, you throw away half your write bandwidth. RAID-5 and RAID-6 are much worse. The solution is to write linearly. If you write linearly to RAID-5/6, and especially if you can write linearly and perfectly aligned with RAID stripes, you can write at the linear speed of the underlying devices. WildFire knows exactly what RAID wants and delivers perfectly aligned writes ensuring absolute maximum throughput. Writing linearly is not only faster, it is safer. When you write randomly, file systems and disk drives often have to play all sorts of games to optimize performance. It is these games that scramble file systems after a crash. WildFire's design never re-orders writes, so data is always clean on the next mount. Random writes also lead to a plethora of ills for storage devices. Flash wears out much faster and hard drives use more power and fail more often. What does this mean for performance. WildFire arrays write faster than would seem possible. For small arrays, writes happen at "drive bandwidth" regardless of block size and queue depth. 4K random writes at 300K IOPS q=1 is easily achieved. 1.8M 4KB random write IOPS is 7.2GB/sec. The WildFire engine is a streaming solution that writes at the speed of the disks regardless of the workload. Even hard drives are transformed by WildFire technology. A 7200 RPM hard disk is lucky to write at 200 IOPS. At 4K, this is less than 1MB/sec. With WildFire, the HDD writes linearly at 100MB/sec or 25K IOPS. 25,000 IOPS is not a number normally associated with rotating disks. With an array of 12 HDDs running RAID-5, the writes can exceed 250K 4K IOPS. Small random writes through WildFire are so fast, and so cheap in terms of overhead, that you can ignore them. In many cases, the array is completely dominated by read overhead as writes are nearly free. Random write overhead just drops off the radar. In many environments, the overhead of random writes is critical. Look at tuning guides for file systems like EXT4 and you see options like "noatime". You see users recommending EXT2 without a journal to reduce Flash wear. The goal of all of these tweaks is to eliminate little random writes. With many storage solutions, these small random writes are enough to push the array over the edge. With WildFire, these random writes are just a tiny part of the linear stream, and are not even measurable, let alone noticeable, even on a busy array. Even if you think you don't have an application that does a lot of random writes, you will still benefit from WildFire technology. Our perfect alignment with RAID-5 and RAID-6 delivers more write bandwidth than your drives have ever delivered, whether they are SSDs or HDDs. Faster writes leaves more time for reads. Shockingly faster writes and more time for reads gives you better application responsiveness. WildFire technology is more than fast. Performance is just the beginning. Check out our white papers on Flash wear, and getting the most of SMR HDDs..